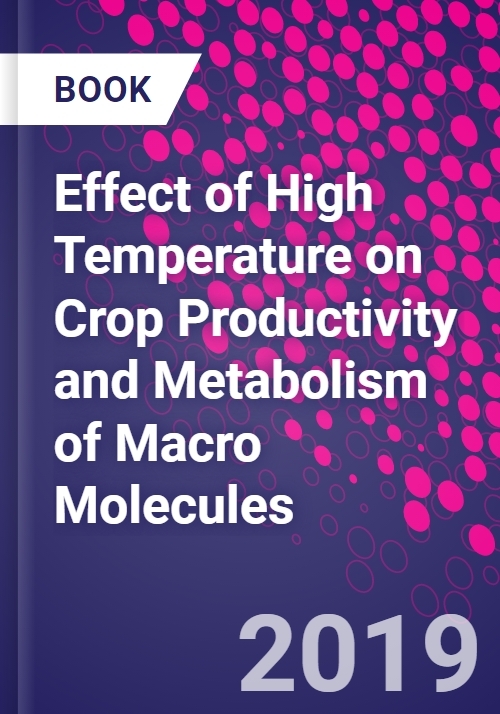 Effect of High Temperature on Crop Productivity and Metabolism of Macro Molecules is a comprehensive overview of the direct relationship of temperatures defined as "high", a definition which increasingly includes a great number of geographic regions. As temperature impacts the number of base growth days, adapting plant selection and planting times, as well as understanding the expected impact of adaptive steps is important for ensuring maximum plant health and crop yield. Global warming, climate change, change in environmental condition etc have become common phrases in nearly every scientific seminar, symposium, meeting and even beyond. These changes in climatic patterns constrain normal growth and reproduction cycles. These changes are of greatest concern to the agricultural scientists who recognize the extent of their potential impact. High temperature during certain crop growth stages causes some reversible and/or irreversible changes in the physiological pattern of plants and they in turn reduce the productivity of crops. Effect of High Temperature on Crop Productivity and Metabolism of Macro Molecules reviews the effect of high temperature on agricultural crop production the and effect of high temperature stress on the metabolic aspects of macro molecules viz., carbohydrate, protein, fat, secondary metabolites, and plant growth hormones. Intended to provide a better understanding on the role of high temperature stress for reduction of crop yield the book also discusses the strategies to overcome the effect of heat stress through molecular breeding and other unconventional methods. Amitav Bhattacharya, Principal Scientist from Indian Institute of Pulses Research - Retired, Kanpur, India. Amitav Bhattacharya earned his M. Sc. degree in Botany (with special paper in Plant Physiology) from Allahabad University, Allahabad, India and his Ph. D. degree in Plant Physiology from the Indian Agricultural Research Institute, New Delhi, India. He is now retired from his role as Principal Scientist at the Indian Institute of Pulses Research, Kanpur - 208024, India where he served approx. 41 years, actively engaged in conducting laboratory as well as field research on pulses (grain legumes). He has published extensively with both books and book chapters.